Once again the world is filled with the merriment and joyful tidings of the holiday season. Gatherings are planned with family members and friends, children are queuing for Santa, and old carols ring out from the radio. 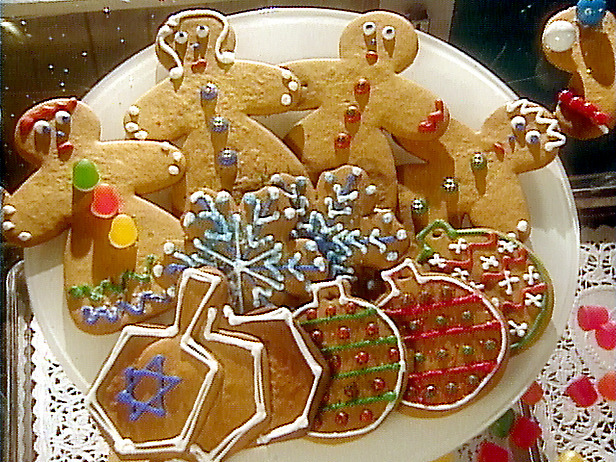 But even as they fill us with us with cheer, the holidays also demand a lot from our spirits. Prolonged anticipation and excitement take a toll, leading to more stress than some of us can handle. Feelings of grief, depression, anxiety, and insomnia are additional unwelcome guests at the party. Luckily, there are a host of holiday films that help us remember what this season is all about – being thankful for what we have and what others do for us each and every day. For something to brighten your mood in the midst of all the celebrations, take a look at this list and find peace in Hollywood’s take on the holidays. A Christmas classic since its inception, this film tells of the life of George Bailey a character who has spent his life in service to his family and his fellow citizens of Bedford Falls, New York. He was known for always helping others at what he feels is the expense of his own life and dreams. When a financial crisis looms, George hits the bottom of his despair and considers suicide, reasoning that all who know him would be better off if he were dead or had never existed at all. The spiritual message comes in the form of a bumbling angel sent down to help George see how much he has enriched the lives of those around him, in turn enriching his own life. This film is one of the best of the Christmas Classics. The Bishop’s Wife tells a story of an angel (Cary Grant) who comes down to earth in answer to a busy Bishop’s (David Niven) prayer. The angel helps the Bishop learn to adjust his priorities and comes close to falling in love with Julia, the Bishop’s wife (Loretta Young). The movie includes a lovely Skating/ Dance. Cary Grant always made everything look easy, but just how much work went into that illusion is exemplified by this film. Before shooting began, Grant could not ice skate, play the harp, or speak any French. By the time “The Bishop’s Wife” was finished shooting, he could do all three. It was truly an accomplishment of heavenly proportions. The film itself was nominated for an Academy Award as Best Picture, and received another nomination for Best Director. Make this movie a tradition for your family this year. Six year old Susan has doubts childhood’s most enduring miracle Santa Clause. Her mother told her the “secret” about Santa a long time ago, so Susan doesn’t expect to receive the most important gifts on her Christmas list. But after meeting a special department stare Santa who’s convinced he’s the real thing, Susan is given the most precious gift of all – something to believe in. Delightful Christmas fantasy of a charming old man who believes he is Santa Claus, and the wonderful change he brings to the people around him. This perennial holiday classic is on many short-lists of the all time great Christmas movies. The film just oozes with warm-hearted humor. Very young Natalie Wood sparkles as Susan, who learns to stop being so grown up, and enjoy childhood, with all its wide-eyed wonder. Edmund Gwenn plays Kris Kringle, and lives the role. He totally connects with the kiddies who visit “Santa” at Macy’s department store. A modern take on A Christmas Carol, Bill Murray takes the lead as television executive producer Frank Cross. A cynical modern-day version of Scrooge himself, Frank insists on having his staff work long hours on Christmas Eve to put on a live production of the Dickens classic as a ratings boost and fires an employee on the spot for questioning this decision. Alfre Woodard plays the overworked assistant/modern Bob Cratchit and Frank’s love interest is portrayed by Karen Allen. With Murray’s unique brand of comedic delivery, this modern twist nonetheless manages to portray the goodwill toward all men and Christmas spirit infusion of the original tale. The third in the series of National Lampoon’s Christmas Vacation stars the Griswold family headed by patriarch Clark, played by Chevy Chase, and wife Ellen, played by Beverly D’Angelo. Christmas Vacation tells of the misadventures of the Griswalds in their own home. Clark is determined to have an “old-fashioned family Christmas” but quickly realizes the challenge this presents within such a dysfunctional family group. While exaggerating almost everything about the holidays in his attempt to achieve his goal, Clark eventually comes to realize the true spiritual meaning of Christmas and embraces the family differences and flaws. Another strong message of family ties and acceptance, Home Alone tells the story of eight-year-old Kevin who is accidentally left behind when his extended family goes away for their Christmas vacation. While Kevin initially sees his family as a burden and is overjoyed to be free of them, by the end of the film, he has come to realize what his family truly means to him. Ultimately, we see, through Kevin, that having family and friends around during the holidays is much more important and spiritually satisfying than any number of gifts under the tree. Will Ferrell portrays Buddy, a human raised as an elf at the North Pole. While having the childlike mindset of an elf, Buddy is easily twice the size of all the other elves and thus always seems a bit out of place. Unfortunately, travelling to New York City to find his birth father, played by James Caan, doesn’t result in his fitting in either, as his elf enthusiasm and wonder at all around him wreaks havoc with his straight-laced father’s lifestyle. However, by the end of this classic and well- loved film priorities are reevaluated and the characters at both the North Pole and in New York City realize that our differences should be celebrated, not condemned. While by no means all-inclusive of all the feel-good movies available during the holidays, these films are each a good place to start. Whatever your viewing pleasure, may the holidays bring you the spiritual peace and happiness you deserve. Wishing you peace, love, happiness, and serenity this Christmas season. 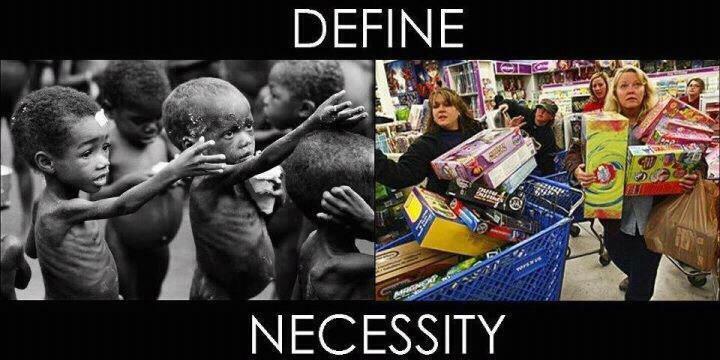 What Is The Difference Between Necessity And Want? People have become so disconnected with the truth that they do not often understand what the difference is between necessity and want. Something necessary or indispensable: food, shelter, and other necessities of life. The fact of being necessary or indispensable; indispensability: the necessity of adequate housing. People will be lined up for days outside of large corporate businesses to purchase things that they think they need, must have or give! There are millions throughout America and the world who would be happy just to have the bare necessities of life such as mentioned above. Most people are manipulated and controlled by the Media, Internet, and society at large, to think that they need things that they really could live without. If you’re going to shop on black Friday please go to a small business in your local area and support them. Small businesses are going under very quickly because of the large corporations. Think if you were living in a third world country you’d be grateful for just a decent meal and not concerned about purchasing a gift for someone that you really don’t care about because they bought you something. Choose to not be controlled by the world. Why not make simple gifts at home and involve your whole family? Donate your time at a homeless shelter. Volunteer to help out in hospitals. People are very lonely during the holidays and you could do a lot to help others. Helping others is the key to helping yourself. Why not change your lifestyle starting today. This week is about Thanks Giving and that’s what every day should be about-giving thanks. You are more fortunate than you think. In this world we are living through a time of both great darkness and light. We have war, and corporate control, alongside a great spiritual emergence. It is time to choose which collective time line you want to take. Trust your heart rather than what you see on the news or told by authority. This is a wonderful tradition to start for little children. Remind them that the Elves make the toys and are Santa Claus helpers, so they understand why they are planting seeds. Explain that the Elves will leave them a gift. The night before Christmas take a bowl and fill it with sugar or flour. Then have the children plant candy in the bowl as seeds. Once the children are in bed remove the candy and fill the bowl with Candy Canes. Can you imagine the looks on their precious little faces in the morning when they see the gift that the Elves gave them? Create new memories this Christmas that will last a lifetime. Do You Know What A Necessity Is? 1. Something necessary or indispensable: food, shelter, and other necessities of life. 2. The fact of being necessary or indispensable; indispensability: the necessity of adequate housing. People have been lined up for days outside of large corporate businesses to purchase things that they think they need, must have or give! There are millions throughout America and the world who would be happy just to have the bare necessities of life such as mentioned above. Most people are manipulated and controlled by the media to think that they need things that they really could live without. Donate your time at a homeless shelter. Volunteer to help out in hospitals. People are very lonely during the holidays and you could do a lot to help others. Why not change your lifestyle starting today. This week is about thanksgiving and that’s what every day should be about-giving thanks. You are more fortunate than you think. festivities. Let’s try in this small way to pay a tiny bit of what we owe. Make people stop and think of our heroes, living and dead, who sacrificed themselves for us.